Get Your Freek On @ FreeMyCampus! ~ Android Forever! Get Your Freek On @ FreeMyCampus! 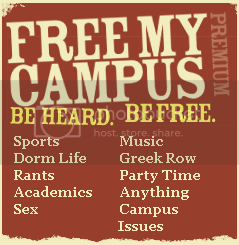 FreeMyCampus.com is an edgy, controversial, and humorous digital magazine for college students. This site is built to empower student writers to build national and campus audiences around college life topics. Readers get to rank stories by giving their daily freek points. Take a look by clicking on the logo graphic above.